Summary: Researchers have use nanotechnology to develop a 1:1 scale model of the blood-brain barrier. 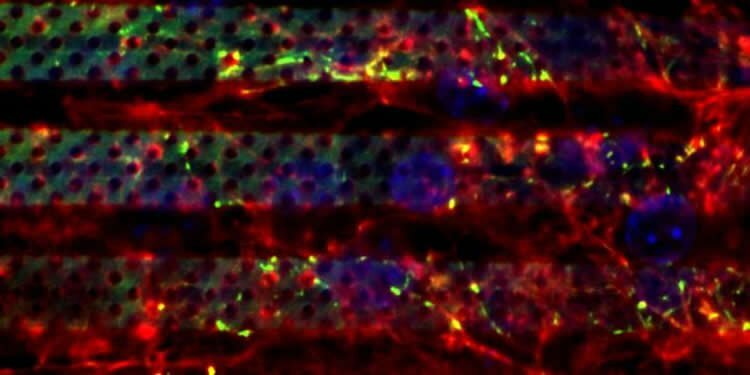 Researchers at IIT-Istituto Italiano di Tecnologia fabricated an artificial device reproducing a 1:1 scale model of the blood-brain barrier (BBB), the anatomical and functional structure that protects the central nervous system from external substances, such as contaminants, but also drugs when they are injected intravenously into the body. The device, which is a combination of artificial and biological components, will be fundamental for studying new therapeutic strategies to overcome blood-brain barrier and treat brain diseases, such as tumors. The study was coordinated by Gianni Ciofani, researcher at IIT in Pontedera (Pisa) and Professor at Politecnico di Torino, in the framework of the research project SLaMM funded by the European Research Council (ERC) and aiming at developing new nanotechnologies for the treatment of brain diseases. The device is described in a paper published today by the scientific journal Small and highlighted by the journal inside cover: it is a microfluidic device that combines artificial components made with 3-D advanced microfabrication techniques (two-photon lithography) and biological ones, that is endothelial cells (the cells covering blood vessels). The microprinting was realized with advanced 3D printing technologies (Nanoscribe), that make use of a laser that scans through a liquid photopolymer and solidifies the material locally and layer by layer building complex 3D objects with submicron resolution. Using this manufacturing technique researchers were able to engineer an accurate real-scale model of the BBB made from a photopolymer resin. Mimicking the brain microcapillaries, the model consists of a microfluidic system of 50 parallel cylindrical channels connected by junctions and featuring pores on the cylinder walls. Each of the tubular structures has a diameter of 10 μm and pores of 1 μm diameter uniformly distributed on all cylinders. After the fabrication of the complex scaffold-like polymer structure, endothelial cells were cultivated around the porous microcapillary system. Covering the 3D printed structure, the cells built a biological barrier resulting in a biohybrid system which resembles its natural model. The device is few millimeters big and fluids can pass through it at the same pressure as blood in brain vessels. This is a confocal image of 3-D bio-hybrid microfluidic blood-brain barrier model: endothelial cells have been stained in blue for nuclei, in red for f-actin, in green for tight junctions. NeuroscienceNews.com image is adapted from the IIT news release. The prototype has been developed owing to an extremely multidisciplinary approach, that was based on micro- nanofabrication competencies, modeling and microfluidodynamics. In the future researchers will use the device to understand the interaction of drugs or of drug delivery nano-vectors to overcome the blood-brain barrier and target the central nervous system. The main goal is to find new therapeutic strategies for the treatment of brain cancer and brain diseases, such as Alzheimer and multiple sclerosis. Funding: The study was funded by European Research Council. Image Source: NeuroscienceNews.com image is adapted from the IIT news release. Original Research: Abstract in Small. IIT “First Hybrid Nanotech Device Mimicking the Blood-Brain Barrier.” NeuroscienceNews. NeuroscienceNews, 8 February 2018. IIT “First Hybrid Nanotech Device Mimicking the Blood-Brain Barrier.” http://neurosciencenews.com/hybrid-nanotech-bbb-8453/ (accessed February 8, 2018). The investigation of the crossing of exogenous substances through the blood-brain barrier (BBB) is object of intensive research in biomedicine, and one of the main obstacles for reliable in vitro evaluations is represented by the difficulties at the base of developing realistic models of the barrier, which could resemble as most accurately as possible the in vivo environment. Here, for the first time, a 1:1 scale, biomimetic, and biohybrid BBB model is proposed. Microtubes inspired to the brain capillaries were fabricated through two-photon lithography and used as scaffolds for the co-culturing of endothelial-like bEnd.3 and U87 glioblastoma cells. The constructs show the maturation of tight junctions, good performances in terms of hindering dextran diffusion through the barrier, and a satisfactory trans-endothelial electrical resistance. Moreover, a mathematical model is developed, which assists in both the design of the 3D microfluidic chip and its characterization. Overall, these results show the effective formation of a bioinspired cellular barrier based on microtubes reproducing brain microcapillaries to scale. This system will be exploited as a realistic in vitro model for the investigation of BBB crossing of nanomaterials and drugs, envisaging therapeutic and diagnostic applications for several brain pathologies, including brain cancer.